Market-mature electroheating technologies such as induction, resistance, infrared, electric-arc and radio-frequency as well as microwave heating are available today to support the electrification process and accelerate decarbonization. Promising innovative technologies such as laser, electron-beam and plasma-arc heating are emerging, and need to be further developed. Electroheating technologies generate heat directly inside the target material, making use of electromagnetic phenomena on a micro-level. At this level, thermodynamics no longer apply since the concern is about generating rather than transmitting heat. This makes electroheating highly efficient. Even some of the non-metallic materials such as rubber and glass can be heated more effectively with electroheating. Compared to conventional (fossil) heating, electroheating in industry reduces final energy demand by a factor of 1.5 to 8. Reductions of a factor of 2-3 are most common, especially when considering the reduced oxidation losses in electrical furnaces. Additionally, these technologies demonstrate other benefits such as improved economic productivity, product quality and worker conditions, among other things. Electroheating can reach high temperatures rapidly: e.g. 2,000 degrees Celsius (°C) in two seconds. Furthermore, this heat can be applied very locally, for instance for surface hardening, leading to value-added manufacturing. These technologies facilitate fully automated production, making them compatible with industry 4.0 while leading to a smaller footprint of machines in factories. At the system level, electroheating facilitates demand responsiveness, allowing industry to more actively participate in the electricity market, mitigating its energy costs while facilitating deeper integration of renewables. Electrification also contributes to a circular economy, as it reduces material losses due to oxidation in furnaces. Typically, 2-4% of material is lost in fossil burners while in electric furnaces this is below 1%. The percentage difference appears small but can be very significant when accounting for the full lifecycle environmental impact of the material lost in the thermal process. To illustrate, a ceramic tile manufacturer in Spain saved 75% of final energy by switching to induction heating. Additionally, the heating process shortened from four hours to one hour, increasing the productivity of the process. In the UK, a beverage manufacturer saved GBP 10,000 in energy costs per year when switching to infrared heating. Furthermore, the new oven saved factory space by allowing a single cold rinse line for both juices and carbonated drinks. 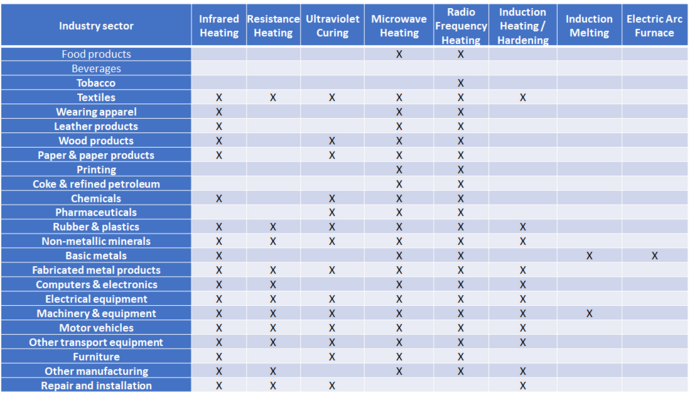 Electroheating offers a wide variety of technologies that can be used in different industrial sectors. Some technologies can be used throughout industry, others such as induction melting or arc furnaces are more dedicated to one sector. This shows that electrification can be used primarily for value-added manufacturing of metal parts, ceramic, rubber and plastic products and machinery, including repair. Currently, the use of fossil energy in EU industry is around 150 Mtoe per year. In a recent study commissioned by the European Copper Institute with EPRI, the electrification potential from six electroheating technologies has been estimated at about a third of industry’s fossil energy use. This means a technical savings potential for fossil fuels of 51 Mtoe/year. Taking into account the above mentioned improvement in end-use efficiency, such fuel-switching would lead to a new electricity demand of 252 TWh/year. In a fully decarbonized electricity system, such electrification leads to 107 MtCO2 reduction of annual greenhouse gas emissions. 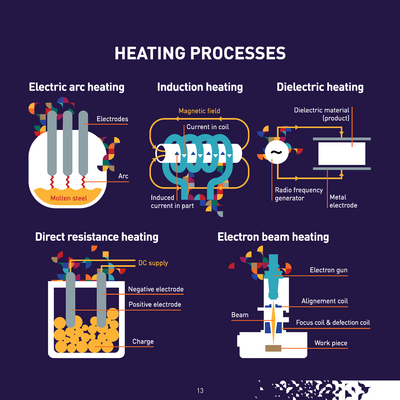 The six electroheating technologies under study target mainly the decarbonization of high temperature processes, for which low carbon alternatives are limited. Remaining uses of fossil fuels target lower-temperature applications such as steam production, for which there are more alternatives. Such processes require temperatures between 120 and 260 °C for which heat pumps and solar heating technologies can often provide alternatives. 1. Recognizing heat electrification based on renewable energy sources in the EU Heating & Cooling Strategy. 2. Contributing to energy savings in the framework of the Energy Efficiency Directive. 3. Including explicit focus on possibilities for substituting fossil fuels with renewable electricity, primarily in high temperature industrial processes applied to the six aforementioned furnace technologies, in the context of the Renewable Energy Directive. 4. 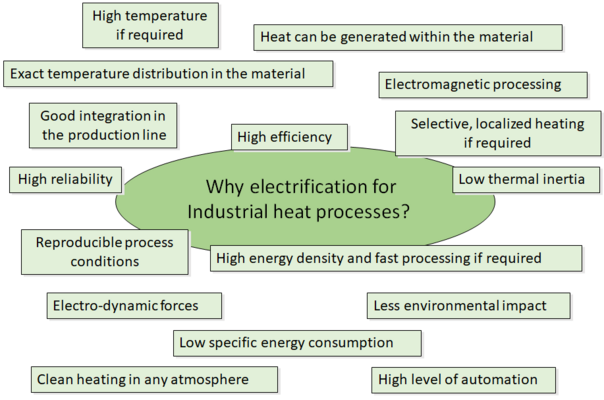 Defining guidance on electrification of heat in the Best Available Technologies (BAT) Reference Documents. 5. Facilitating development of innovative electrification processes through research. 6. Supporting knowledge sharing by establishing a competence network. 7. Demonstrating the potential of novel electrification technologies through pilot and demonstration projects.